Fat Tuesday in celebration of Mardi Gras 2012 is just about a week away now!!! Problem is, the term “Fat Tuesday” probably has my photograph posted next to it on Wikipedia. I have been bad, bad, bad, bad, bad the last……oh, let’s say 10 years to be honest. I quit exercising every day but continued to shovel in the food and drink despite the ever-expanding hips, thighs, belly and “Oprah arms” waving back at me in the mirror. This year, instead of the tower of fried catfish, vat of jambalaya, shrimp étouffé, hush puppies, King’s cake and hurricanes I’ve routinely enjoyed in the past, I’m pledging to lighten up. 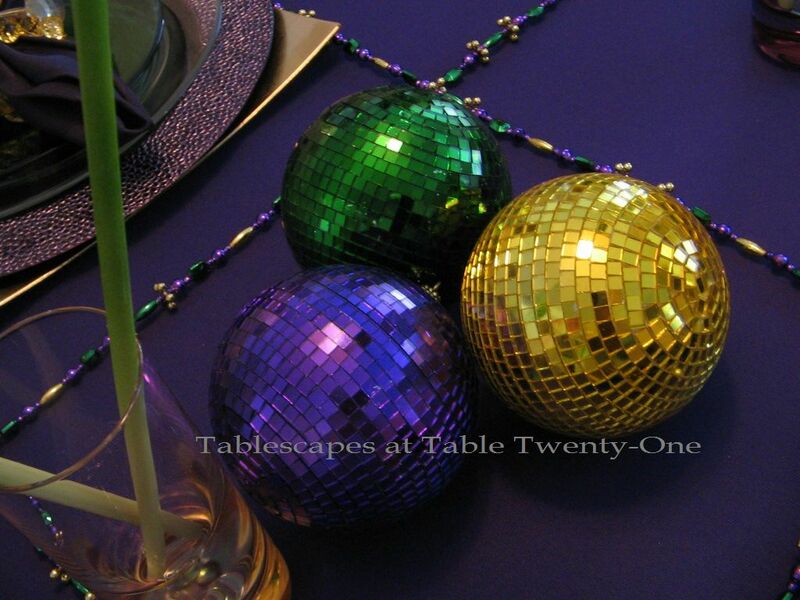 To that end, I have also created a Fat Tuesday/Mardi Gras tablescape “lite”…an upscale, sophisticated, pared down version of the more decadent Mardi Gras style to which I am accustomed and hold so dear. I’ve never used a royal purple table linen for any occasion, but this year it lands on the table as the base of the tablescape. Dual chargers in a gold square and purple cobblestone round cradle a clear glass dinner plate and green glass salad plate, thus incorporating all the traditional colors. A royal purple cotton napkin is cinched with a flirty bangle napkin ring from Bed Bath & Beyond. Goldtone flatware works well with the place setting. I was so pleased to see that I had stemware of a similar shape in purple (TJ Maxx), green (Dollar Tree), and gold (World Market). I’m going to give credit where it’s due. 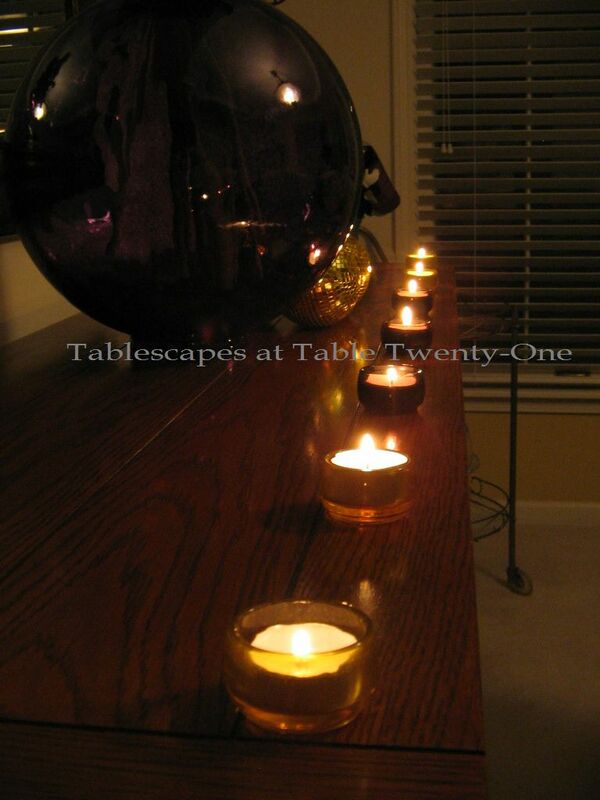 It was totally my husband’s -who fancies himself “The Tablescape Whisperer” – idea to include the long strands of beads. I resisted, thinking it would be way too cliché to have bundles of them down the center of the table. Plus, I whined, it will take away from the clean lines! We compromised, and I ended up arranging them in this quieter “grid” that frames each place setting as well as the centerpiece elements. 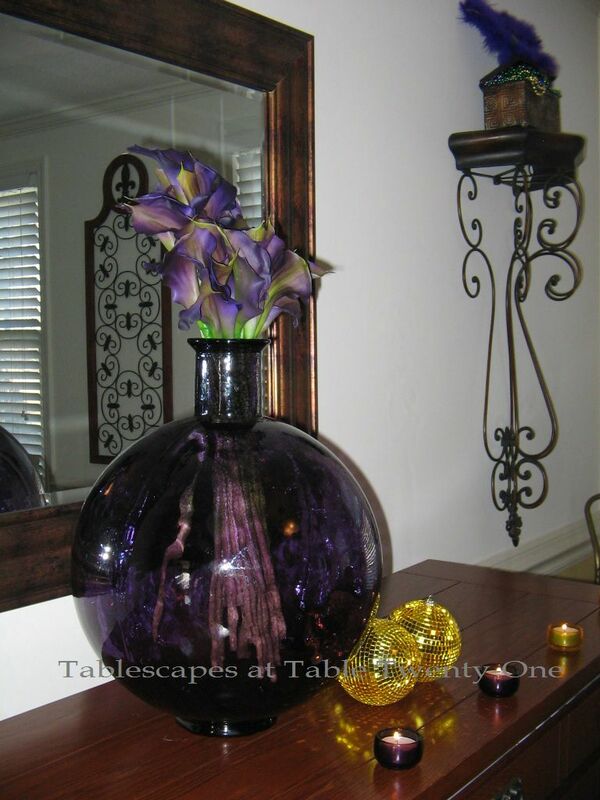 Purple, green, and gold glass vases hold simply-arranged royal purple calla lilies. Finishing out the centerpiece are clusters of Mardi Gras “disco balls” that catch the light. The buffet in back of the table is also relatively staid with a single, albeit oversized, royal purple Vidrios San Miguel recycled glass vase stuffed with an arrangement of graduated purple calla lilies. Using a single piece in a dramatic size and color negates the need for lots of little pieces all over the buffet top. Purple and gold glass votives dot the buffet’s edge and add to the overall ambiance in the room. I don’t think they make gumbo-flavored rice cakes, so I’ll have to come up with something that will be healthy, filling and tasty without sending me into carb/fat/sodium/sugar overload. Yeah, I know…good luck with that! 🙂 New plan: Stick with the old eating plan, but eat it at the pared down table! Love it! 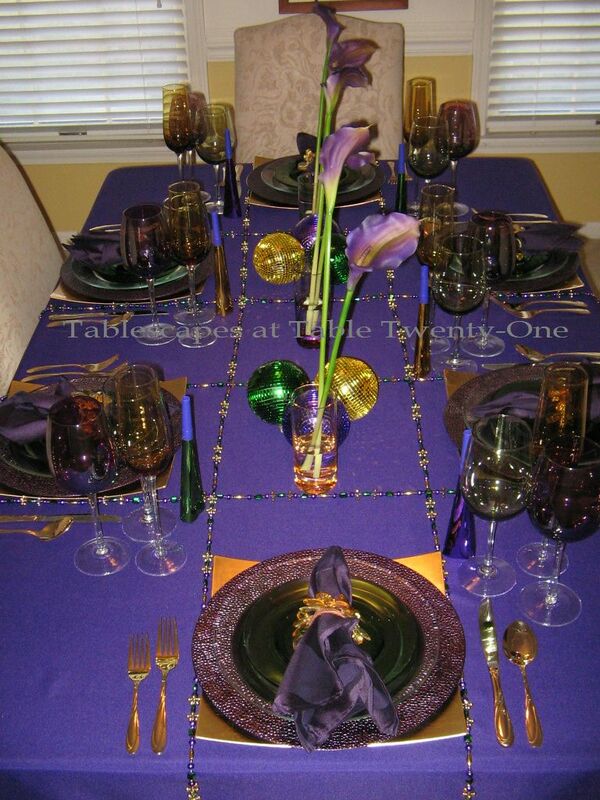 Please join me for Tablescape Thursday again this week to see how other tablescapers from around the globe are decorating for and celebrating Mardi Gras! Laissez bon temps rouler, y‘all!!! Alycia…you are beyond…beyond..the master of the table…This is gorgeous! I forgot that Mardi Gras was right around the corner!! !…The table is so festive and ready for a party!! !…Happy Valentine’s Day!! Whhhelllll! If Ramon isn’t the master ‘scaper to suggest the beads–they, and the grid pattern, caught my eye immediately! Very creative use of the tried and true beads. I love the layered dishes and chargers, and I can hardly believe you had these goblets–in the perfect shades–from different stores. It looks wonderful! Oh, and the purple calla lillies–what a lovely touch. You’re right; even clergy would be happy at this table, but not because it’s boring!! Lovely, lovely, lovely, Alycia. Gorgeous! If this is low-key, I am sure I would be flattened by your high-key! Alycia, let this Louisiana girl tell you how much I love that table!! The purple callas are Gorgeous!!!! Your hubby was right on point with the beads down the table…the grids are so pretty! I love it all! Please pop in and get in on my new giveaway. Happy Valentine’s Day!! Wow I love all the color! The beads look great done that way- that was a smart idea on how to incorporate them without it being a jumble of beads heaped somewhere. The purple tablecloth really sets the stage! Love it! That’s pretty cool that you had the coordinating goblets like that! Love the dual stacked chargers- great look! The purple callas are so pretty and look grand standing there….looks like a party to me!! Alycia, your table is B-U-T-ful!!!! I do love the dark gem tone colors. Tell hubby that the beads look great! ;0) Your purple chargers are gorgeous! I just love it all! Happy Valentine’s Day! Glad you got talked into the beads. It’s just not Mardi Gras without beads. You’ve got great stuff. I always like the tall things you’re able to add to your decor. Better lock the door when I’m in town. My boys have gone to many parades only to yell “BEADS….BEADS”…..so you had me at the BEADS….. LOVE THE GLITZ and the BLING that IS MARDI GRAS!!!!! Ramon knows his Mardi Gras MUSTS HAVES!!!!! You bring it to the table with STYLE and SOPHISTICATION THIS YEAR….FABULOUS!!!!! Love the PURPLE echo of color in the FLOWERS, the MANTLE and in the MASK, as well as the YELLOW AND GREEN which marry the colors into a FESTIVAL!!!!!!! WELL DONE AND STILL ONE WEEK AHEAD OF EVERYONE….. BEEEEEEAAAAAADDDDDSSSSSS!!!!!!! Gorgeous colors Alycia. I have always wanted to do a purple tablescape. I just might have to sneak in some new dishes and glassware…..ha ha. Love the beads. Give your hubby some kudos for a great idea on the bling. It goes with the theme. We have to give them credit now and then. I know Jacqueline would love the purple too. Looks like a fun time for all. Dieting is not fun and so unfair. I guess it goes hand and hand with getting older….Did I just say that word? Oh my. Beautiful my friend. Enjoy! Just love it ! The colors are beautiful. Whoo! Alycia! 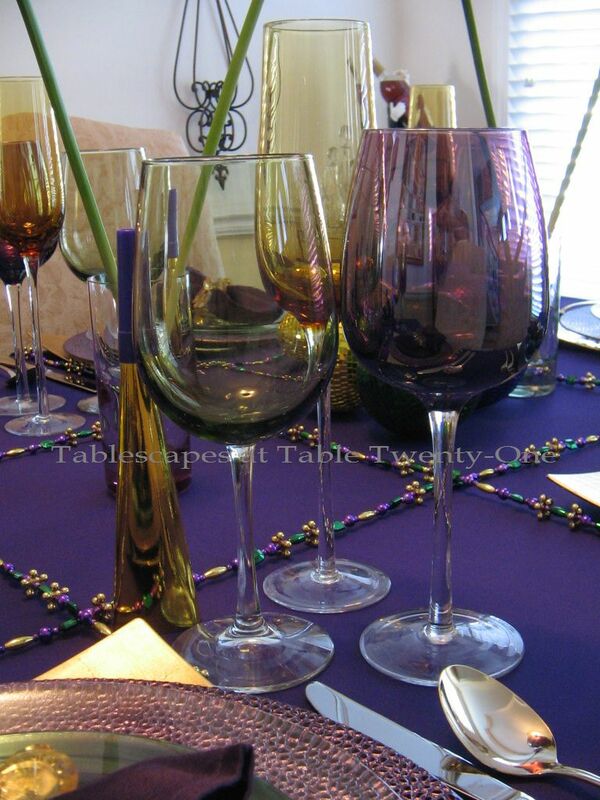 Your Mardi Gras lite tablescape is gorgeous with the purple tablecloth and I love Ramon’s idea for the grid work of beads. Way to go, Ramon! I wish we celebrated Mardi Gras here in Georgia, but the closest Mardi Gras thing I see here is King cake at Publix. Hugs and hope you had a happy Valentine’s Day. So, no swinging from the balcony. The vat of jamalaya is out, ix-nay on the king cake.hmmm…….I guess this gorgeous table will suffice. Happy Valentine’s Day! 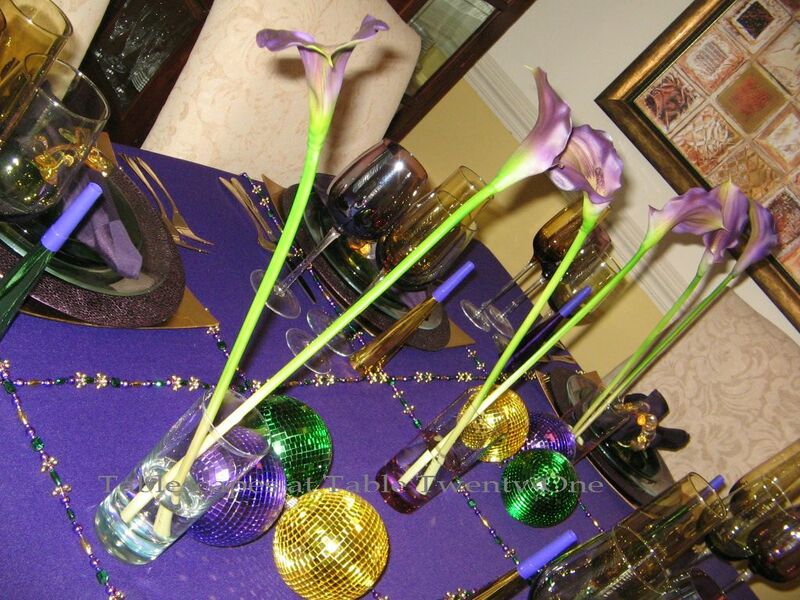 Now on to the next holiday…I’m lovin’ the bead grid, disco balls, and the purple calla lilies. This tablescape is fit for a King! What a beautiful table! I just love those chargers and the Calla’s were a perfect touch! So you have a tablescape whisperer in your house too!! Loved the bead grid. 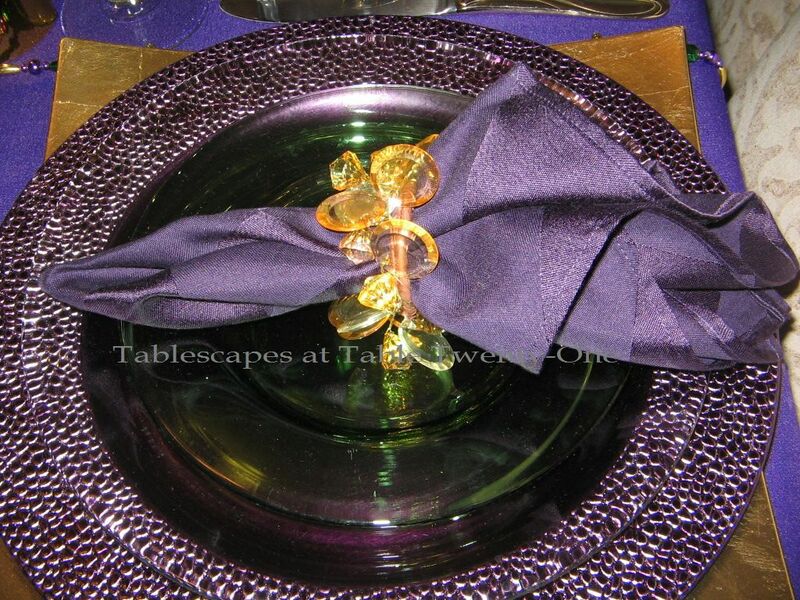 The flourescence of the finish on the stemware really looks nice with the purple cloth/napkins and charger. The three color combination is a winner. I do like the “lesser” look for this theme. I can relate to the image in the mirror. We just recently decided to try to go vegetarian and watch more what jumps in our grocery store cart all by itself! Oh Alycia, you crack me up, low key!!!!!! 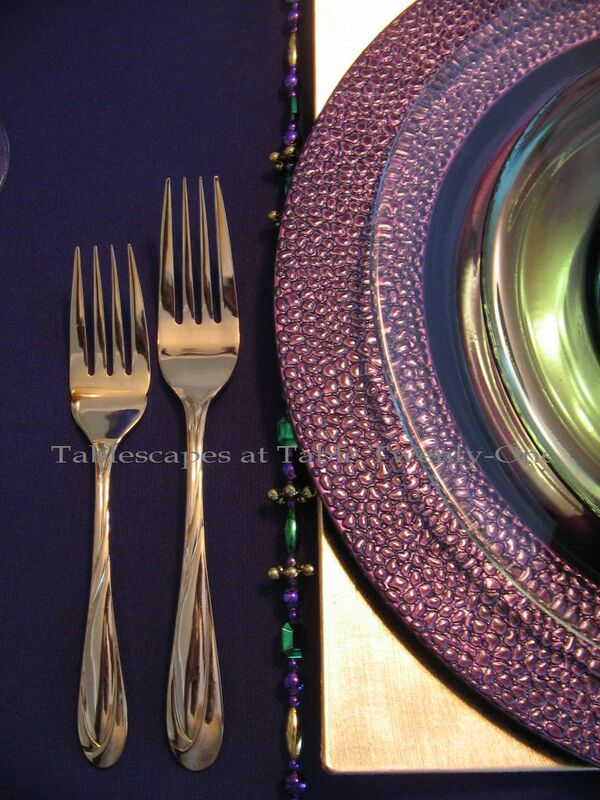 I love all the purple, from chargers, stemware and tablecloth…simply gorgeous for Mardi Gra. Love the bead grid too. The callas are so pretty and the perfect finishing touch. You’re a perfect tablescaper my dear friend. Wow, I love those purple pebbled chargers, very nice! I also like how you divided the table with the beads, very clever! Anyway, love the table, very sophisticated. Now shove some of those donuts down before we are forced to eat hot cross buns for a month! Hope your mom isn’t reading this or she will slap me silly! Mine is rolling her eyes from above! Love it!!! Awesome chargers. Great use of the beads. Don’t you just love Mardi Gras time for giving us such great colors with which to work? Any time I can use purple I’m a happy girl, and it looks like I need to borrow a few things from you. You’ve got the purple going, and it is great. I can never look at one of your tables without thinking how much fun it would be to explore one of your storage areas. Hugs to you today. What a cool table, Alycia! I love the pebbled purple chargers…the stemware is also great. 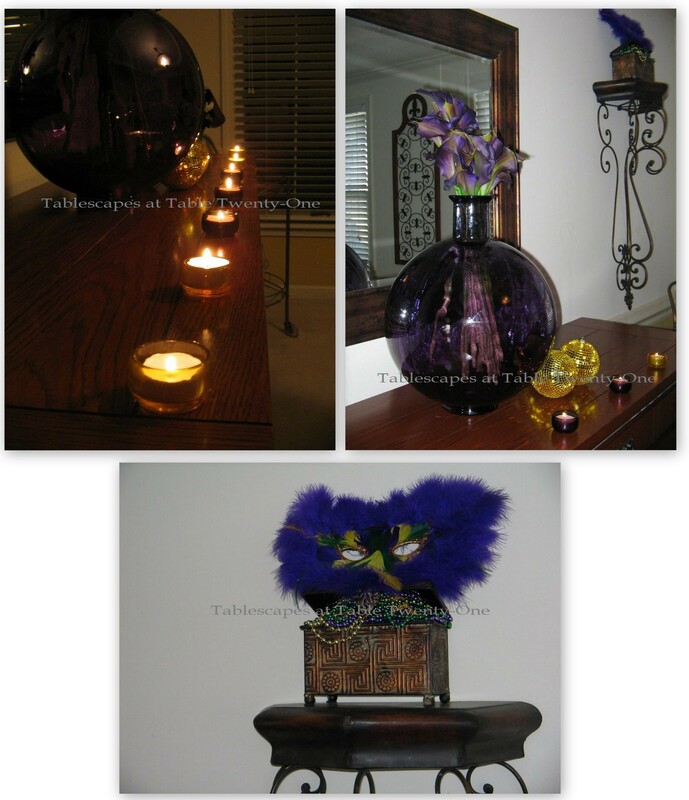 I am glad that the Tablescape Whisperer got in way, the beads add a nice touch to your table. That should read, got his way, not in way! You have outdone yourself again. So elegant gorgeous.Love it all. This table could go in my house whether it is Mardi Gras or not. Those chargers are fabulous! The callas are beautiful too. 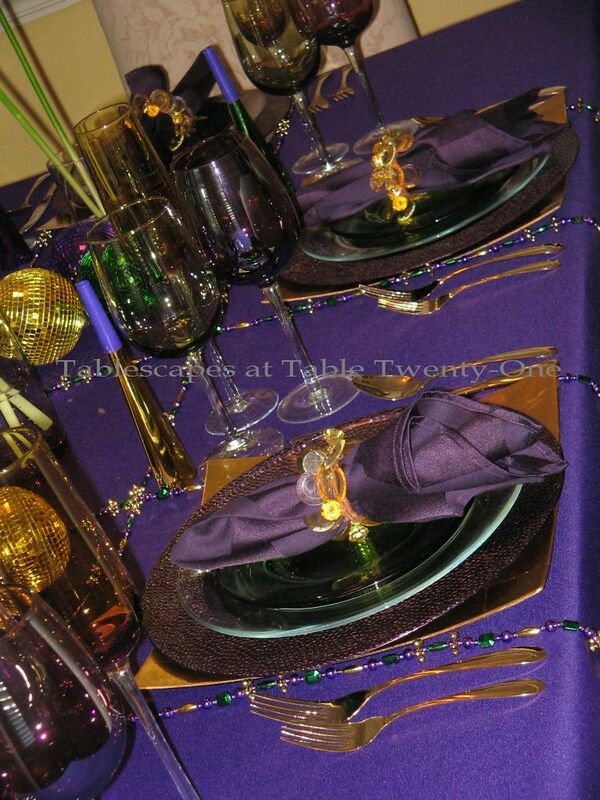 This Mardi Gras table is just elegant – but I expect no less from you! Beautiful! Only you could rock purple like that. Absolutely stunning table. The purple, green and gold look great together. Love that vase on the buffet. The grid of beads was a clever idea. Love those chargers, too. I don’t think a little fried catfish would hurt anyone! Fish is good for us, right? I really love this upscale MG table. The purple is just gorgeous (OMG, I am lovin’ those purple chargers!) and the three shades of goblets work beautifully together! I have to tell my staging clients ALL the time that one larger dramatic piece works better than a lot of little ones. The single flowers make a wonderfully dramatic statement. Can’t wait to see what the “Tablescape Whisperer” contributes next! Girl, I’m telling you….you have just GOT to stop bragging about that Ramon! He’s going to be on every woman’s “most wanted” list! Only you would consider this a “lite”ly decorated table. BTW, am I the only one who is having trouble viewing your posts that I get by following you on email? It loads for just a split second and then everything disappears. It is just such a tease! Is it just my quirky computer? If you’re doing this to me, it’s sorta mean! Oh but I love the beads! I am so glad your husband is a tablescape whisperer, haha, we need more of those. Your scape is wonderful! I love the Mardi Gras colors. I certainly think you nailed it for a classy one! Enjoy! 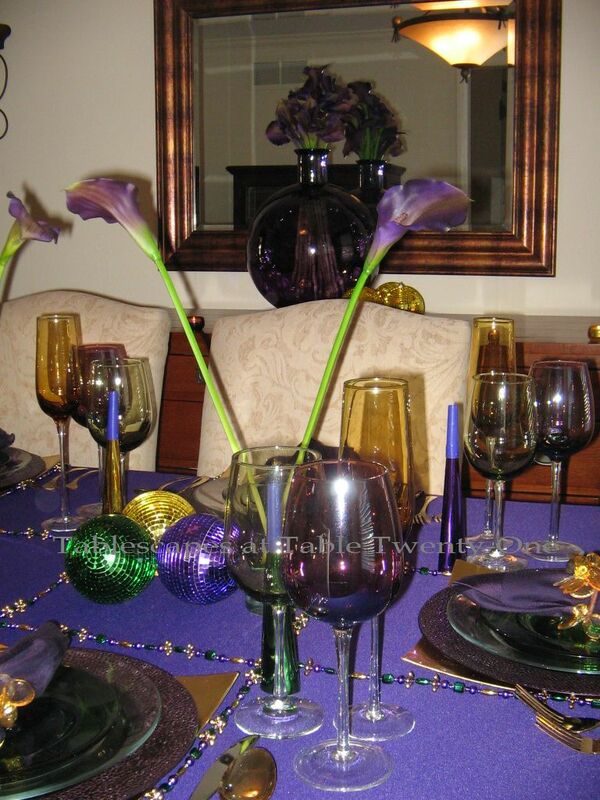 I love your understated elegant Mardi Gras table! I literally laughed out loud at the swinging from the chandelier statement. Those calla lilies are wonderful and I am with you in the battle to lighten up!!! 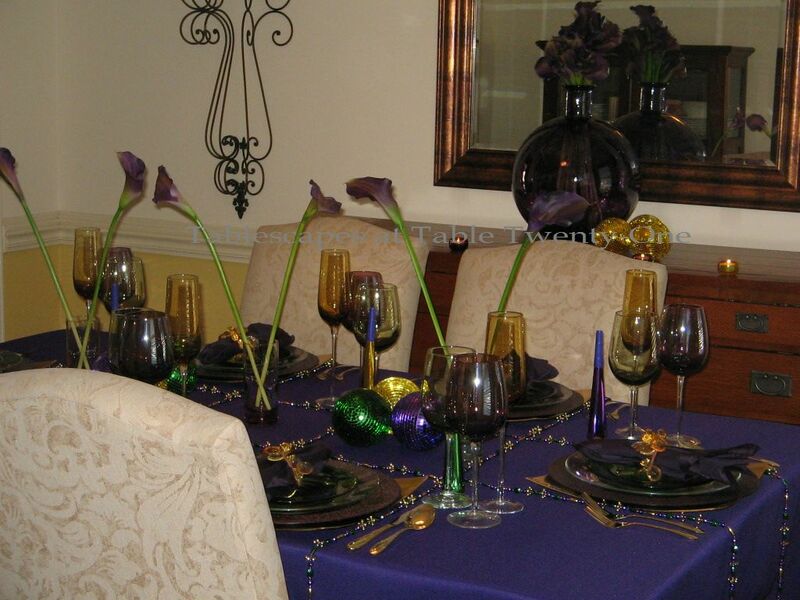 Alycia, love your Mardi Gras Lite tablescape. Love the purple, green and gold traditional colors of Mardi Gras. Your three colors of stemware are perfect for the occasion and are really calling my name. I love stemware and need it in every color!! I have been looking for the perfect shade of aqua stemware but no luck yet. I hear you on the eating, I swim a lot of laps but seem to eat too much food. (those laps make me hungry)! I think your guests will have a blast at your party. Thanks for sharing this fabulous tablescape. Ha! Ah Alysia, you have the “Tablescape Whisperer” and I have the “Enabler” 🙂 Love the simple, pared down, elegant look of your table. The way you used the beads? Pure genius my friend! I love you calla lilies too, so elegant ! Thank you again for keeping us in your thoughts. Have a wonderful weekend! What a fantastic, fun table! LOVE! I love those purple beaded chargers!! Your table is fabulous! It has been hard for me to eat right. Lately it has been about getting what is most convenient just to at least eat.